I’ve been beyond excited to see a number of my co-workers step up and become bloggers for www.jdbengineeirng.com. There’s a vastly inaccurate perception among far too many technical professionals that they don’t have anything important to say (write). The reality is that they are oozing with knowledge, and things that they don’t deem important, much less consider thought leadership, may be exactly what their clients and prospects are looking for. Technical professionals in the A/E/C industry are Subject Matter Experts (SMEs), but it can sometimes be difficult for them to understand that most people don’t know what they know! Our clients and prospects may be SMEs in their own right – but typically at other subjects or in other industries. Otherwise, why would they need to hire us? For some people, writing comes easy. But for far more people – particularly those in highly technical occupations, like within the A/E/C industry – writing a blog or an article can be an intimidating pursuit. Authoring a study or crafting specifications is one thing, but providing insight to the masses is another! I recently shared the “Three Rs” with my colleagues. No, this is not a groundbreaking scientific formula, but rather three simple things that a beginning blogger (or accomplished blogger, for that matter), can do to easily develop meaningful content. Content can come from myriad places, but for those struggling to come up with an idea to write about – or actually generate content around that idea – these R’s are a good place to start! Research – There’s an unlimited world of content out there. All it takes a bit of research! In fact, I rely heavily on research when it comes to blogging and developing presentations. Research can make a Subject Matter Amateur look like a Subject Matter Expert. For example, earlier this year I was invited by a friend to present about workforce trends. She’s an HR professional. I’m a marketing and BD guy. What could I possibly have to offer? Well, I love researching trends – our industry and beyond – and it is one of my favorite topics to present about. I had touched on a number of critical workforce trends over the years, and after I agreed to co-present, I dug deeper. I visited human resources websites and read workforce publications. I came up with a ton of trends, and after another meeting with my friend, had a whole bunch more! This research – which was undertaken for a specific presentation opportunity – became the basis for a series of blog posts for Engineering News-Record. Think of all the things that you’ve researched recently. New products. Alternative delivery approaches. Trends. Industry-specific best practices. The latest code revisions. All of these make perfect content for blogs. Report – Think like a reporter. Understand that there’s a lot of extremely intelligent SMEs out there, and use them to help develop content for your blog! Interview them – gain their insight, quote them in your blog, and everyone wins. Your interview subject gets to be viewed as the “outside expert” (or “inside expert,” if you are quoting a co-worker!). Your blog content will be elevated. And your readers will gain a greater understanding of the topic you are blogging about. Using the example of the workforce presentation, when it came to writing my ENR blog, I felt it important to interview my friend and co-presenter. On one hand, she really is the Subject Matter Expert on workforce – she’s a successful workforce advisor for a living. On the other hand, we collaborated to develop and give the presentation, and she is a part owner of the content we generated. It was only fair to make sure she was an important part of the blog! So I quoted her liberally throughout the series of posts. She added great insight and helped to interpret the trends that I addressed. Who do you know that you could interview? Co-workers? Vendors? Clients? Friends? Colleagues at professional societies? Community leaders? Social media connections? When you think about it, the list is endless. As an added benefit, when you quote someone in your blog, you earn goodwill, strengthen a relationship, and have someone else sharing your content. Be sure to include their picture, a link to their company or institution website, and a link to their LinkedIn profile or online bio – with their permission, of course! Repurpose – This one is as simple as it sounds. Look around you – you are constantly generating content, whether you know it or not. Much of your job involves content creation – often for clients. In the example of the workforce blog, the research was originally conducted for a presentation for which I was co-presenter. I was subsequently invited to give a presentation with similar content – but needed to greatly expand it and present as a solo act. When I create a PowerPoint presentation, I tend to be fairly liberal with the Notes section so that if I give the presentation again in the future, I’ll know what I was thinking when I originally created the slide deck. (I often use a large image with a few words on a slide, so it is important to populate the Notes to understand the content intent.) Such was the case with this second workforce presentation. A few weeks after delivering it, I was on a train and found myself with a lot of time at my disposal. So I pulled up the PowerPoint, copied the Notes content into a Word file, and began using that information to write a new blog post. In the process, I realized that I had far more content than was needed for a single blog, so I broke it into a series of posts – combining my repurposed content with quotes from my friend. But repurposing doesn’t stop there. 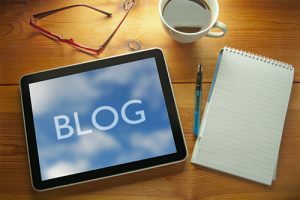 The content of the blog post you are currently reading actually came from an email I sent to several co-workers about, you guessed it, the Three R’s of blogging. I shared the same insight and anecdotes, and joked at the end that I was going to turn the email into a blog post! A few minutes after I sent that email, a coworker responded that he had just submitted a report to a client, and there were four or five paragraphs within the report that were education-focused – information that would make perfect content for a blog post! Yes, this blog post is essentially a repurposed email. Consider everything you’ve researched and written over the past few years – what could be repurposed? Obviously, you cannot share proprietary information or violate Non-Disclosure Agreements, but there’s a lot of information that can be shared generically. Think about studies you’ve written. Presentations you’ve given – even within your own department or for a company lunch-and-learn. Content that you’ve shared with clients along the way – even as simple as the pros and cons of a certain type of system, delivery approach, or product/material. Or maybe, if you’re lucky, you have an email or two that could be used. You’ve already generated the content, now repurpose it for a blog post or two! Information is all around us, and everyone has value to offer. However, it can be difficult to translate that value from the brain to the computer. Using the Three R’s formula – Research, Report, Repurpose – you can enhance your content, simplify the process, and provide more value for your readers. You’ve reached the end of this post – more than 1250 words created by repurposing an email sent to a handful of people! Need help with your content strategy or training for your staff? Check out jdbIQity’s services, or contact Scott Butcher.